The same has been well demonstrated by one of the Digiperform students who believed in his capabilities and followed his heart which lead him to success. Whereas, Digiperform believes to impart digital marketing training to those who really want to upgrade their skills. And, it feels a great pleasure when our students accomplish something big. Meet Digiperformer Faisal Rahman, a travel freak, who has recently got appointed by top MNC – FIS Global for the role of Google Ads Specialist, while continuing the advanced digital marketing course with us. Faisal has evinced that if you really want to achieve something big, just believe in yourself and your mentors. That faith along with your hard work will definitely lead you to success. A Happy feeling for us! It’s a great news for us. Therefore, we decided to congratulate him and ask how’s been the journey so far. Why did he decide to choose digital marketing as a career? And, how the experience with Digiperform is going on? Faisal: I am a travel freak and absolutely love traveling because I feel that’s the best thing (a happiness) money can buy. I like to keep my weekends to rejuvenate myself by doing things l like and investing my time by taking Digital marketing and Spanish classes. Currently, I have been doing advanced level digital marketing course with Digiperform and also working with one of the top MNCs – FIS as a Google Ads Specialist. Faisal: Digital marketing is booming and growing industry like anything. It’s fresh industry in the market which has a lot of scope when it comes to job opportunities. Faisal: I did a complete research while enrolling myself for a digital marketing course. After reading reviews and discussing with known ones, I realized Digiperform needs no introduction. It is one of the best institutes for digital marketing that anyone can find. Faisal: As a learner, I look forward to my class every weekend because there is so much you can relate to, learn and apply in my current role. Also, it helps me keep me updated. As a customer, when I went to enroll for my class, I came across Digiperform’s management who were quite helpful. They not only gave me excellent guidance but called me up 2 days later, especially to inform me about some great discounts/offers, introduced by Digiperform recently. Faisal: Definitely. It outranks all other institutes in terms of the syllabus and faculty. I would also recommend Digiperform’s trainers, they have a great package of knowledge and experience. Faisal: I would say 8.5, for there is always room for improvement. Faisal: I see myself as a Google Ads Account Manager handling an entire team. Also, working as a freelancer for additional income. Faisal: If you’re looking for a change into something more rewarding, definitely check out some options in the field of digital marketing. Faisal: Digiperform is the mentor in the starting point of my career in the field of Digital marketing. Thanks, Faisal for sharing your valuable feedback. It’s a proud feeling that you are part of Digiperform family now. We wish you a great luck and success in your career. 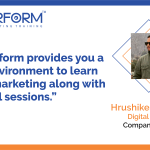 Digiperform provides you a great environment to learn digital marketing along with practical sessions.